In Spring Season, players from dozens of countries across the world competed for a chance for the prize. In Fall Season, we’re opening up the competition to everywhere in the world where Clash Royale is played. With the addition of the Rest of the World region, all Clash Royale players everywhere can play in Fall Season. At the end of Fall Season, one first place champion from each region will advance to World Finals in December! The following details apply to the North America, Europe, and Latin America regions. Full details on the remaining global regions will be announced soon! The qualifying phases of Fall Season begins on August 16th with the Crown Championship 20 Win Challenge. Additional qualifying bracketed tournaments will take place after the 20 Win Challenge, from August 23rd through August 28th. On September 5th through 7th, twelve newly qualified players in each region will play in a regional Elimination Week that will include 4 returning players from Spring Season that have already proven their skill. Half of these 16 players will advance to the Top 10 phase, joined by the top 2 players from each region’s Spring Season. The Top 10 phase will last from September 12th to October 26th. The top six players from the Top 10 phase will compete in their region’s Fall Finals on the weekend of November 11th – 12th. Each region’s Fall Champion will automatically claim the first spot to represent their region in the World Finals event this December, held live in London. For Fall Season, players are competing for part of a global prize pool of over $1,000,000 USD. A second World Finals spot exists for each region at the end of the Fall Season. Top-performing players in Fall Season will have a chance to compete for the final spot before World Finals. If you have a Clash Royale account that is Level 8 or higher, and are over 16 years of age, you can join! The battle begins on August 16th inside the Clash Royale app and lasts through August 20th – just look for the Crown Championship 20 Win Challenge under your Tournaments tab. You must be 16 years of age to advance, but anyone can win in-game prizes in this first step of the tournament. For later phases of the tournament, participants must have proof of residence in their registered country, and will need to provide photo identification upon request. All players who participate in Fall Finals must attend a live competition from November 11th to 12th. Supercell will provide transportation and accommodations for live contestants. Where Can I Watch the Battles? The Crown Championship will be broadcast live from our esports studios around the world, starting with the Elimination Week games on September 5th. After September 5th, the Crown Championship will be broadcast on Tuesday, Wednesday, and Thursday nights each week, from our YouTube Channel, on Twitch, and on Facebook. Step one, battle in the Clash Royale app! On August 16th, the Crown Championship 20 Win Challenge will open to all players with level 8 accounts. The Crown Championship 20 Win Challenge is like a more difficult version of a Grand Challenge. If you complete the Crown Championship 20 Win Challenge by getting 20 wins before losing three games, you will qualify for the next phase of battles. 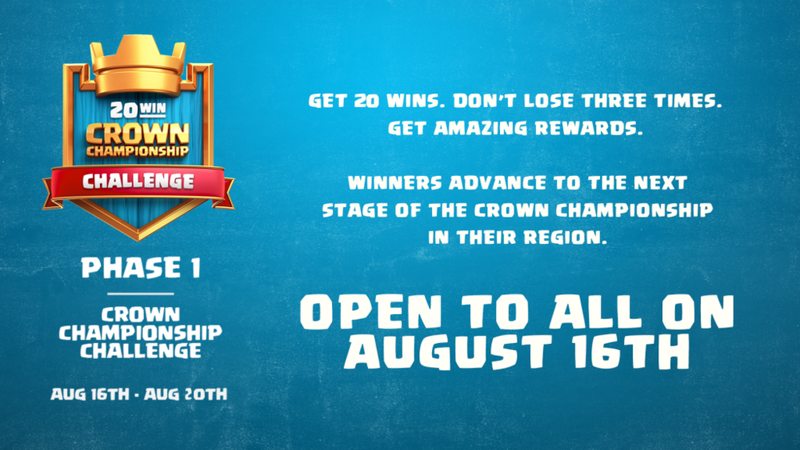 The Crown Championship 20 Win Challenge ends on August 20th. All winners will receive a message from Clash Royale in their inbox with a link to register for the next step! During Bracket Play, players who completed the Crown Championship 20 Win Challenge will battle over 6 days of single-elimination regional bracketed tournaments. The top players from each bracketed tournament will advance to the next phase. All matches are best-of-3 games. Tournaments will be multiple entry after a short window of single entry to ensure all players have a chance to participate. A total of 12 players in each region will advance from Bracket Play to the next phase of the competition. Final Bracket Play details will be announced by August 21st, once all players have advanced through the Crown Championship 20 Win Challenge. The 12 top players from Bracket Play move on from Bracket Play to fight in their region’s Elimination Week, a one-day, double-elimination bracket. All matches are best-of-3 games. An additional 4 players from the Spring 2017 Season Finals will be automatically qualified into the Elimination Week, with preferential seeding, bringing the total amount of competitors to 16. The top 8 players from Elimination Week will advance to the Top 10 phase, seven weeks of intense competition. This is played as a Double Round Robin format. The top 2 players from each region’s Spring 2017 Season Finals will be automatically qualified into the Top 10 phase, bringing the total participants in each regions to 10. Each player will face each other player in their region twice during this phase. All matches are best-of-3 games. The best 6 players by match wins will advance to the next phase. The Top 6 players from the Top 10 phase will advance to Fall Finals, a double elimination competition for the title of Fall Champion. Players will be seeded based on their match wins from the Top 10 phase. All matches are best-of-3 games. The Grand Finals will be best-of-5 games. All players will play live at their regional Crown Championship studios. The Fall Champion will be the first player in their region to advance to World Finals in December.